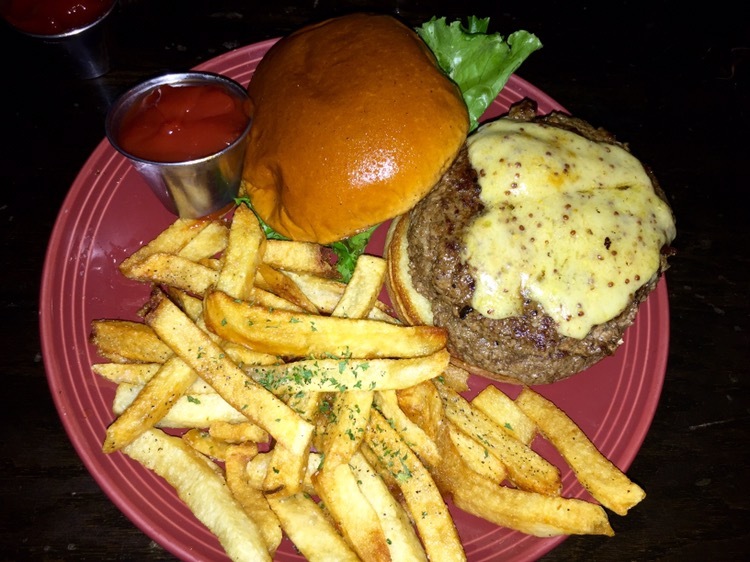 Somewhere along the way, either someone told me or I read somewhere how good the hamburgers were at Elder Tree Public House and I put it on the list. 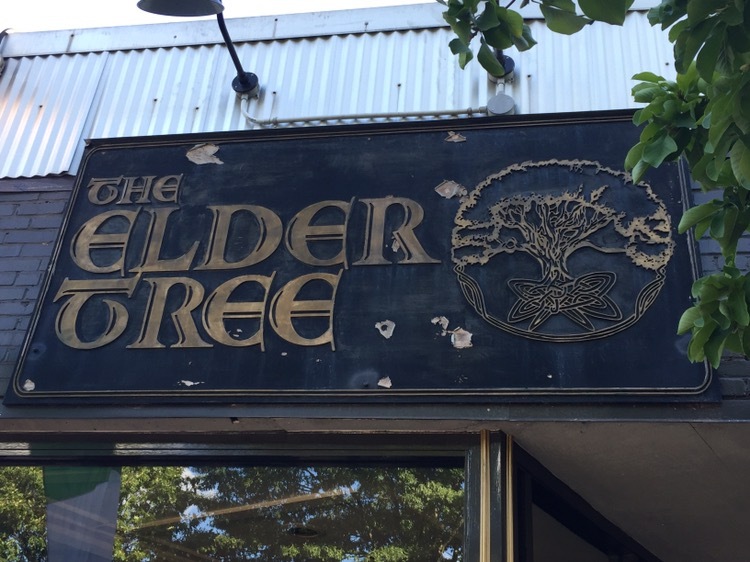 For the life of me, I can’t remember who told me or where I saw it… When we went to the Earl a couple of months back, I noticed Elder Tree across the street and made a mental note of its location. 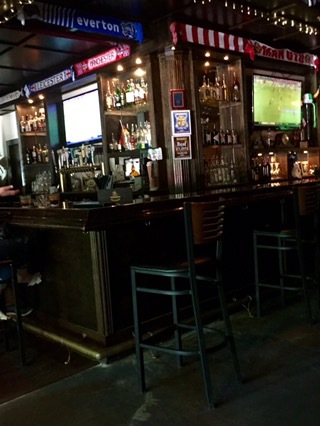 On this Sunday evening we rolled in around 5:30 and found a small crowd watching Premier League futball. Aside from the immense display of soccer team flags, the second most prominent feature is the (almost) overwhelming darkness. The photo above gives you an idea – it’s been lightened and was taken from the first table, at 5:30 in the afternoon on a very sunny summer Sunday. It was that dark. For dinner, my beloved chose the Jam Tart – a marinated and grilled chicken breast, serve with pear chutney, Stilton bleu cheese, lettuce, tomato and sautéed onions, on a brioche bun. She took off the top of the bun, to decrease the volume of bread, and really enjoyed this sandwich. I was there for the burger, so I ordered the Gunner – the house patty with lettuce, tomato and onion and added a slice of red dragon cheese (like pepper cheddar). The menu had the option to add a second patty for $4 and I assumed that meant that I should be expecting a thin 4 ounce patty and a double would be just right. Then the burger arrived. This was one massive burger. And when I sliced it in half, it was cooked to a perfect medium. The fries were fresh cut and hot when my burger arrived. It’s been a while since I didn’t finish a burger, but I failed to return an empty plate. A note to whoever told me about this place: Thanks! 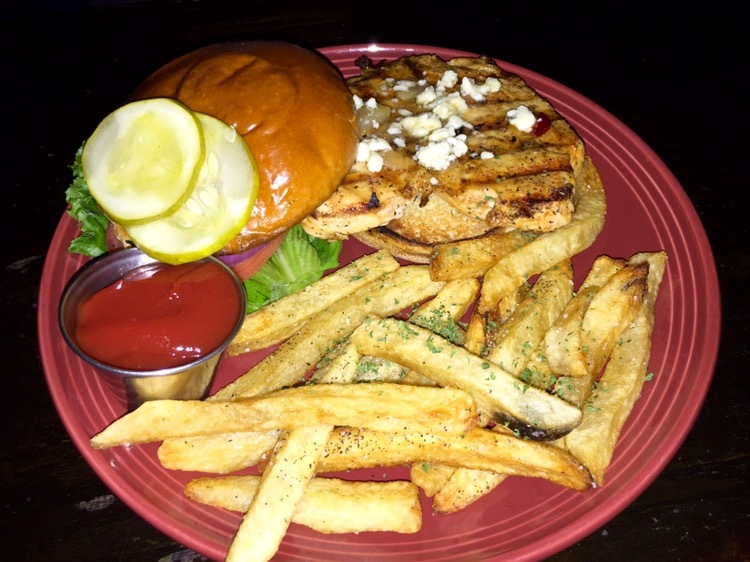 You were right – the burger was excellent.